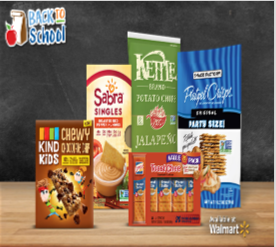 Back To School At Walmart Sweepstakes – Win up to $50,000! Win up to $50,000 (see details below)! ENTER SWEEPSTAKES HERE – Walmart sweepstakes page. ENTRY LIMIT – LIMIT: fifteen (15) entries per calendar (one per tile) per day ET per person per email address. SWEEPSTAKES ENTRY PERIOD – The Back To School At Walmart Sweepstakes begins Friday, July 27, 2018 at 12:00:01 a.m. (midnight) Eastern Daylight Time (“EDT”) and ends Saturday, September 1, 2018 at 11:59:59 p.m. EDT. Cash prize to be paid by check made payable to the winner. Sponsor, in its sole discretion, reserves the right to determine the date, time and location of the Grand Prize Event (“Prize Event”) for a chance to win up to $50,000. The envelope selection process will take place at a location determined by the sponsor. Complete instructions will be issued to each winner. ARV range $1,000 to $50,000. Ten (10) Second Prizes: Each winner to receive one (1) Chrome Notebook (Sponsor to select make and model based on availability at the time prize is awarded). ARV $500 each. One hundred (100) Third Prizes: Each winner to receive one (1) $100 Walmart Gift Card. Terms and conditions of the Gift Card apply. ARV $100 each. One hundred (100) Fourth Prizes: Each winner to receive one (1) $25 Walmart Gift Card. Terms and conditions of the Gift Card apply. ARV $25 each. WINNER’S LIST – To obtain the names of the winners (available after 9/20/18 send a self-addressed stamped envelope to: Back To School At Walmart Sweepstakes Winners, P.O. Box 2312, Framingham, MA 01703-2312. All such requests must be received by 9/27/18.